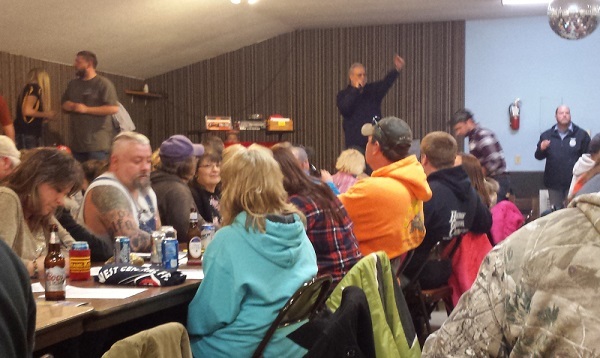 On Saturday, January 28, 2017, members of the West Central FFA Alumni held an auction at Walking Eagle Hall in Oquawka to raise money to support the local FFA. According to Jerry Keimig, one of the local FFA alumni and a volunteer helping out at the event, Saturday's auction was the first time a separate live auction was used to raise funds. Previously a silent auction had been held in conjunction with the school's annual FFA banquet. Saturday's activities included a dinner of pulled pork and fried fish along with party potatoes, baked beans, coleslaw, chips and cookies. There was a gun raffle and the auction of over 50 donated prizes ranging from bags of seed, ag-chemical applications, hauling and storage of crops, and tools, to select parking spots at the July 1st Tractor Pull. The funds raised by the auction go to support chapter activities and scholarships. They also provide students with the opportunity to attend a variety of FFA events including state and national FFA conventions, Washington Leadership Conference in Washington DC, state FFA leadership camp. This year's West Central FFA President is Kami Endress. In addition to presiding over the West Central FFA she is also Regional Section 4 Vice President. She listed FFA's main goals as premier leadership, personal growth and career success. She described how FFA Career Development Events (CDE) give students the opportunity to develop critical thinking skills, communicate clearly and perform effectively in a competitive job market. Kami described the events held during the upcoming FFA week Feb 18 - 25 as follows. Tuesday will be camo day and drive your tractor to school day. Wednesday is official dress day and officers will be working on the Food For America drive with the third graders. On Thursday members are encouraged to wear their chapter T shirt. There will also be an FFA assembly that day. Addressing the crowd at the auction Kami said that while watching the auction or the sale of T-shirts and DVD's she sees the various ways in which the local FFA is helped. Upcoming events for West Central FFA members include the chapter banquet on March 23rd, the Duck Race on May 27th, FFA state convention in June and the Tractor Pull on July 1st.